York Hotel has been flying in hawkers from Penang since 1986 for its "Penang Hawkers' Fare" buffet promotion. It is so popular, they do not take reservations. This is my first time trying it, and I went with Aromacookery, who had just come back from Penang (and could vouch for each dish's authenticity). 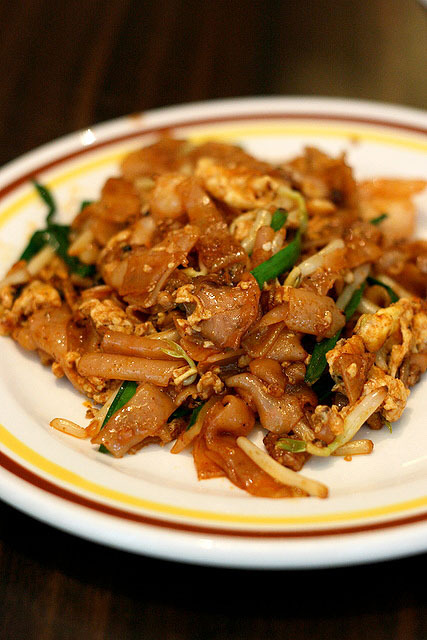 Penang Char Kway Teow - by far the most popular dish at the buffet! The stall is manned by two chefs. From their frying technique alone, you can tell the older one is the "master" (or at least he took more pride in what he was doing). This is his dish. It had nice "wok hei" and flavours that came through nicely. The young man (I shall dub him the "disciple") did not seem to focus as much when frying. His dish turned out to be less appetising indeed. Interesting how the exact same ingredients can turn out differently. This Kway Teow Soup may seem plain, but it's actually quite delicious if you appreciate the "cheng" (clear) flavours. Good stock, fresh herbs, fried minced garlic and sesame oil. 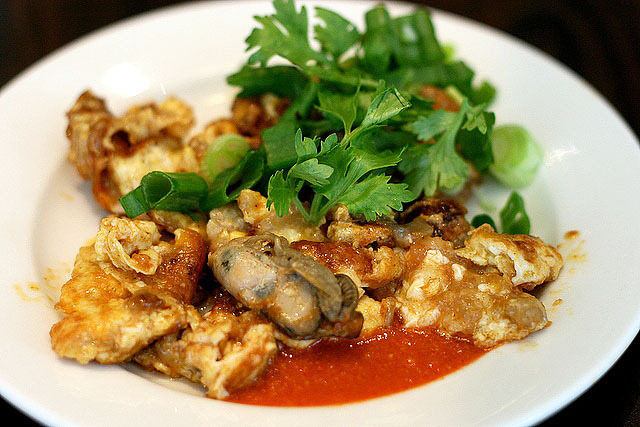 Oyster omelette - fragrant and tasty, although not piping hot. Slightly wet with gooey starch (I like!) in places. There was a health advisory pinned at the counter, cautioning people not to over-indulge in this, lest they experience discomfort later! Penang laksa is incredibly different from laksa farther south - the tangy, spicy, fish-rich broth does not have coconut milk or curry elements. I actually enjoyed this, as it's not as sour as some versions I've encountered. Dollop of the famous Penang prawn paste (hae ko) ups the umami factor by several magnitudes. 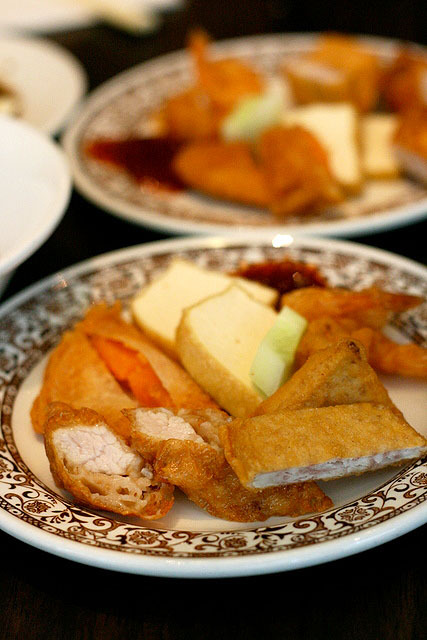 Lor Bak - assorted items (dry beancurd, pork loin, yam, sweet potato, shrimp) lightly battered and fried, served with chili and a starchy, gooey dip. This is like a delicate version of Singapore's 五香虾饼 "wu xiang xia bing" (assorted prawn fritters). We had double helpings of this! 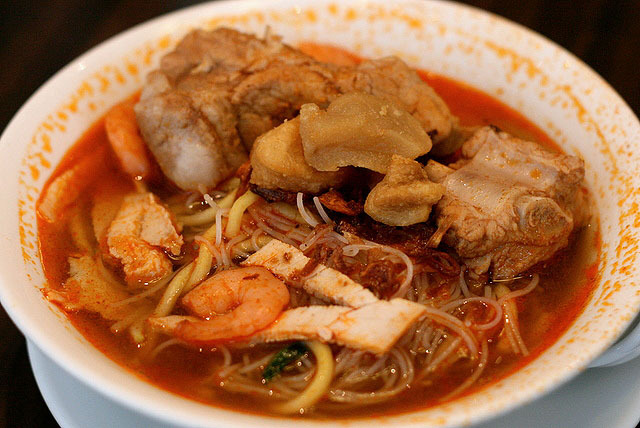 The Penang Hokkien prawn mee. Aromacookery gave the serving lady a smile and was rewarded with extra ingredients! Succulent pork ribs, and extra fried pork lard pieces. The soup is robust and tasty. Pity about the prawns - they look like the frozen variety. 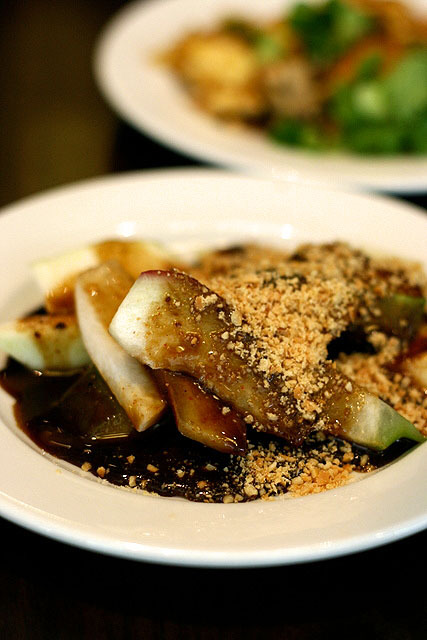 Penang rojak is strongly characterised by the Penang prawn paste (hae ko) which seems extra potent. Sliced rose apple (jambu air), guava, turnip and cucumber make this a refreshing yet intense vitamin C treat. This was actually one of the first items we took because the queues were still short. The ban chang kueh (crispy peanut pancake) is delicious when fresh out of the pan. Lashings of melted Planta margarine hold the crushed peanut and sugar in place. 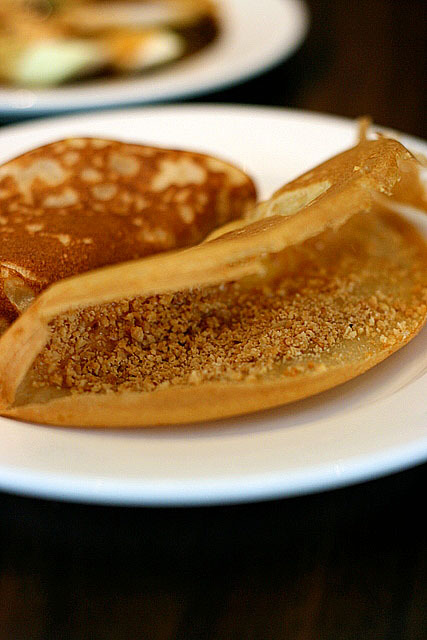 The humble-looking apom balik is a new addition, and a lovely one too. 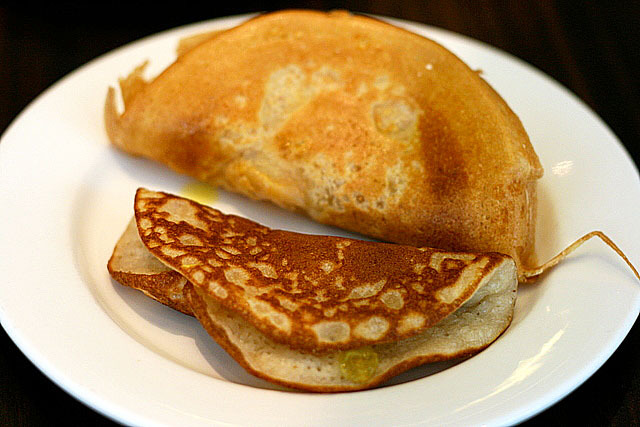 Sweet, ripe, almost caramelised banana slices and shredded coconut form the filling of this soft folded pancake. We went back for seconds towards the end of our meal, only to find they had run out of it! 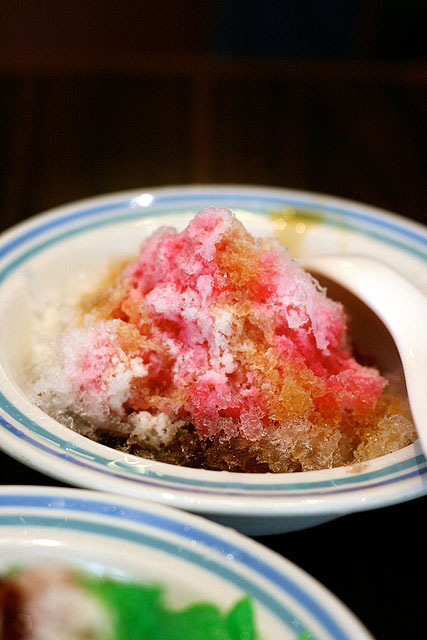 The ice kachang is pretty standard. Syrup, sweetcorn, attap seeds, kidney beans, etc drizzled over shaved ice. The chendol is not the old school type I was hoping for (the watery, milky brown, lightly salty version with faint green noodles). 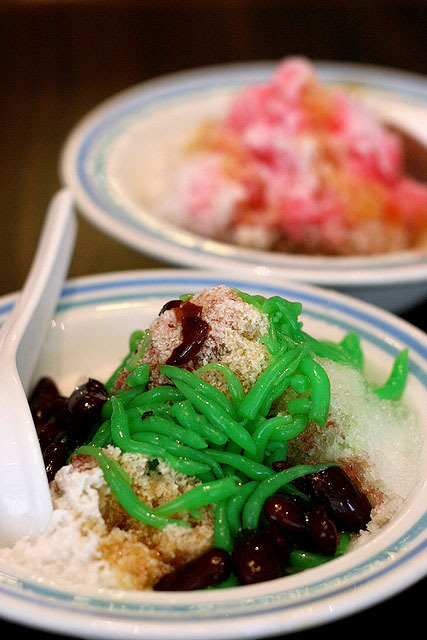 Here it's with ghastly green noodle bits, coconut cream that tastes like it came from a box, and not enough gula melaka. Basically no different from what you get in any food court. 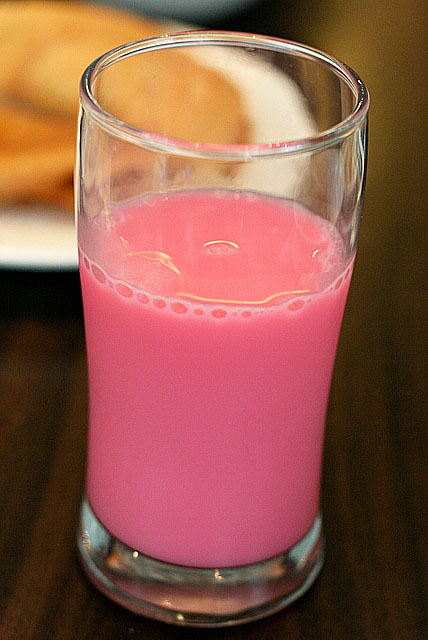 Wash it all down with free-flow bandung (rose syrup and milk). Other drinks are also available at a separate cost - one of the first things the waitresses will offer you as you sit down. But they are not pushy, and will point you to the free bandung at the corner after you decline. Water is served free too, both cold and warm varieties. I'm not sure if the hotel gets top-rate hawkers to fly down each time, but some of the dishes are certainly more than decent. The variety isn't as wide as other buffets, but I like that most of the food is prepared a la minute. The Penang Hawkers' Fare runs in March, September and December (generally during school holidays) every year. The current promotion is from Sept 4-20. See Aromacookery's interpretation of the same lunch. That's so interesting how the same ingredients can be made into something so different - and less appetising - just due to the person cooking it! yeah you can never go wrong with ala minute, watching the chefs wiped out each plate on the spot, makes me more hungry than eating it. lol! 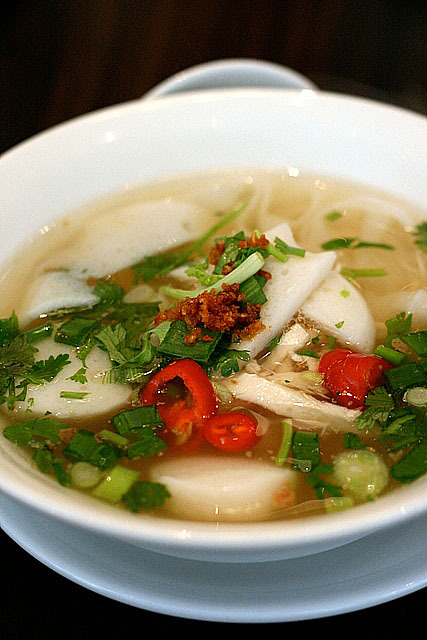 we should have a food tour to Penang! LFB: Ah Kenny, always the romantic! You're absolutely right. On both counts, haha. There's nothing like a good plate of CKT! And yes, the hotel used gas burners, not charcoal. Katie: Takes skill and heart to make a dish good! LIC: Haha, food tour to Penang! oh yummm!!!! l miss bundung water!!! ahhhhhhhh!!!!! I can vouch for the authenticity of the buffet too, born & bred in Penang! Every time the hawkers are in town at York Hotel, my friends and I head over there to stuff out faces silly. Completely agree with you though - the good ones are definitely the char koay teow, prawn mee (hokkien mee in Penang - and if you speak Penang hokkien, the hawkers will be give you extra pork ribs! Yums! 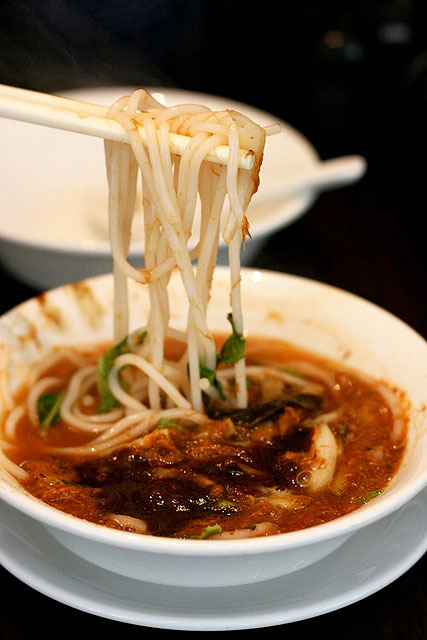 ), asam laksa and absolutely love the the ban chang kueh. Interestingly, the ban chang kueh made by the uncle is crispier than the ones made by his female companion. Wow...looks like you guys are having a good time enjoying the hawker fare. The food looks good. Btw...do come over to Penang. Will love to take you for the roadside hawker food, with a different ambiance and prepared by the hawkers in their casual outfit. Cooking Gallery: thank you! you have a lovely blog yourself! Bone-collector: make your own bandung! rose syrup + milk! Audrey: wow really? your stamp of approval means a lot, penang girl! too bad I can barely speak hokkien, let alone Penang hokkien! ck: yes, Penang hawker food rocks! I'm seriously thinking of a short food trip there...will be checking your blog for the must-try goodies! It'd be great to meet you too! Just came back from the penang food fair dinner with my friends, I must say both the food and service are a great disappointment, this shall be my first and last try. Most dishes are basically sweet based. Even the penang laksa tasted sweet and not sour. The sauce used on the rojak, cuttlefish and another I cannot remember are the same and tasted just like chee cheong fun's sauce! 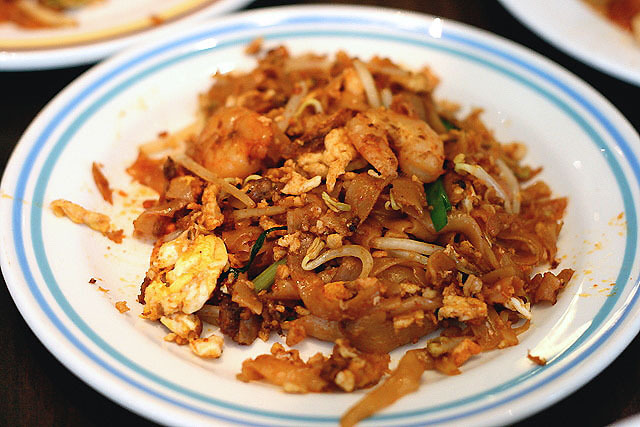 The char kuey teow was saltish and the cockles are particularly tiny, barely can spot them among the kuey teow. Besides the food, the service level of their waiter/waitress/chef is also unacceptable. One of the chef just shoot out her "tongs" to stop my friend from picking another pancake onto her niece's dish after she picked up 2 pieces. I thought that was quite rude!